Around 6 months, babies start to learn all kinds of exciting new skills, like rolling over, sitting up, eating solids (and pooping solids! ), babbling, and even crawling or scooting around the house. And once they start walking, it’s a whole different ball game. In this guide, we’ve put together a list of our favorite gear for grandparents of older babies and toddlers to help make those adorable visits nothing but smoooooth sailing. Because feeding babies in anything other than a high chair becomes a bit of a Jackson Pollock experience, grandparents should definitely consider getting their own high chair to make meal-time easier (read: cleaner). In the high chair world, there are 3 types of chairs: chairs that sit on top of an existing chair (low cost, low impact), those that clamp onto a table or bar top, and those that stand alone. This seat is a simple, space-saving high chair (for kids 6 months to 50 lbs) that attaches with straps to any size dining chair. Once baby doesn’t need the tray anymore, you can use it as a booster for your toddler/preschooler right at the dining table. It’s easy to clean and doesn’t take up a lot of space. Best of all, it’s small and easy to store away. Most “hook on” chairs require a lot of screwing and manual adjusting (while crouched under a table….not fun). Not this one. This new hook-on chair from Chicco has a self-ratcheting system that clamps right on to tables with the simple pull of a strap. It also has a snap-on tray, a 3-point harness, and a removable seat for washing (this is key!). It can hold kiddos up to 37 lbs. While this hook-on chair isn’t as convenient as the Chicco mentioned above, it’s the one for people who have a table or bar top up to 3.5” thick. This seat also holds kids up to 37 lbs, has a removable seat for washing, and easily folds up into a little bag storage bag. To attach this chair, you twist the knobs beneath the arms to secure it to the table (much like a giant C-clamp), which takes a lot longer than the easy pull tab on the Chicco seat (above). Check out the video review here. Although it seems like any high chair that costs $22 must be less than desirable, the Ikea ANTILOP is actually AWESOME. This high chair meets ALL of our requirements for grandparents: it’s cheap, cleans up super easily (there is no upholstery on this chair, which is amazing), and comes apart for storage simply by popping off the legs. We used this chair for both of our kids, and I have no complaints— it’s easy to clean, doesn’t take up much space, and is super lightweight for moving between rooms. Learn more about the ANTILOP here. This is one of our favorite high chairs for grandparents. First of all, we love this chair for its unique swing-open tray. That’s right, you don’t have to fumble with holding the tray and the baby all at once. Genius, I tell you. This nifty (and dishwasher-safe) tray also adjusts front-to-back, which minimizes the crevasse (between your grandkid and the tray) that SO much of their food inevitably falls into. This high chair comes assembled right out of the box (no work required—yay! ), is easy to clean, and has a very compact fold (so you can just slide it out of the way when the grandkids go home). In our opinion, its compactness makes this one of the best high chairs for grandparents on the market, and for a decent price. Check out our full review of the Joovy Nook here. If you like the looks of this chair, but also fancy the idea of a seat that reclines for younger grandbabes, then the Joovy Foodoo high chair might be right up your alley! Around the age of 2, many toddlers become adverse to sitting in a “baby chair,” but still require a boost so they aren’t resting their chins in their mac ‘n cheese. As long as 1) it’s big enough for their tushies, 2) it doesn’t slip around, and 3) you don’t mind if it gets destroyed, a large book or textbook can work quite well as a booster seat in a pinch. This is what my parents do, and my son hasn’t complained yet! This seat has the flexibility to boost your grandkid either 2 inches or 4 inches (with its foam insert), depending on his height. It has a removable harness (because, let’s face it, some kids will NOT let you strap them into their chair) and includes straps to attach the seat securely to your dining chair. We picked this seat because it’s lightweight, comes in a neutral color, and doesn’t take up much room. Another wonderfully simple option is the Luv Chicken, a 4-inch foam cushion with a non-slip, removable cover of laminated cotton that’s super easy to wipe clean. It’s simple, cute and can easily be tucked away for storage. Nuby utensils are made of soft plastic for soft baby gums, and feature non-slip handles. You can find similar sets from Lullababy, Gerber Graduates, and Munchkin. These stainless steel utensils feature softened edges for kids who are just learning how to use them. They have thick, non-slip handles. There are plenty of other options out there too, including Gerber Graduates (spoons and forks or set with knife), Skip Hop, and The First Years. These bowls have a suction cup on the bottom that really works! They’re a great way to keep the majority of your grandkid’s meal off the floor (ha—good luck!). This cute placemat is made with silicone and sticks to the table with suction cups (I have one of these for my house and one for Grandma and Grandpa’s). It’s smaller, so it’s great for taking to restaurants, and it will fit on almost any size high chair tray (like the smaller one that stays at the grandparents’ house). Bumkins bibs come in adorable designs and can be easily washed or wiped clean— even in the laundry. They have little pockets that catch fallen food really well, and they fold up tiny for travel and easy storage in your kitchen. They come in different sizes: starter (4 to 9 mos. ), super (6-24 mos. ), sleeved (6-24 mos.) and junior (1+ yrs). These are great for snack-time—especially when you take your grandkid out of the house. Their lids stop food from spilling all over the floor. Ingenious! *If you prefer to avoid plastics, they also make a stainless steel version. If you’re a local grandparent who has your grandchild over a lot, you may want to get a baby tub and some bathtime gear; after all, you’re going to need to get your grandbaby clean after those inevitable spit-ups, blow-outs, and food messes. When both of my kids outgrew their infant tubs, but were still too small for (and frightened of) the regular tub, this duck flew in and saved the day. It was the best $12 I ever spent! They LOVED sitting in it, quacking, and splashing around in the water. Best of all, this duck can be used inside your regular tub or even on the floor (just keep some towels nearby!). This tub is for babies 6 months and up who can sit up unassisted. These 6” wide grippy treads are a nice alternative to placing a full slip-proof mat on the bottom of your tub. They stick to the bottom of the tub and you can clean right over them. They can be removed without damaging your bathtub, although you’ll only be able to do this once, as they can’t be reused after removal. This well-reviewed bathtub mat can be cleaned in the dishwasher (mind blown!). It’s quite thick and comes with many suction cups. It measures 31.5″ x 15.75″. You can use regular towels to dry your grandbaby after a bath, of course, but once you see them in one of these adorable hooded animal towels, you’ll never want to! There you have it—our top picks for bathtime gear for grandparents. Now grab some baby shampoo, bath toys, washcloths, and maybe one of these ingenious hair rinsers, and you’ll be all set! After 6 months, babies can generally go into any stroller without a car seat or bassinet, so you can get any stroller you darn well please. All of these are lightweight and easy to lift in and out of the car; the prices, however, can vary greatly. Umbrella strollers are great for strolling around places like the zoo, the aquarium, or any paved walking paths—just keep in mind that their tiny wheels are not going to do so well on rougher terrain. For an amazing price, the new 11 lb Summer Infant 3D Mini umbrella stroller delivers some excellent bang for your buck. It’s a bare-bones, economy umbrella stroller, but it actually has features!! It comes with two cup holders in a storage console that can also store your phone and keys. The seat reclines for nappers (somewhat), plus it has a flip-out canopy visor to protect your grandkid from the sun (it’s not the largest out there, but much better than most at this price). This stroller is for the 6 months and up crowd. It’s got a super compact fold, so it won’t take up much room in your car or garage. This is one of the best strollers for grandparents who want something lightweight, compact, and very reasonably priced. If you’re looking to go a step up in terms of build quality, Summer Infant also makes the 3D Lite ($71), a 13 lb umbrella stroller with a carry strap, larger storage basket, cup holder, and anti-shock front wheels that do quite well on pavement, dirt, and cobblestones (but not on gravel or rougher terrain). The 3D Lite’s seat reclines and it has a sun canopy— though it doesn’t provide the best coverage. If sun protection is a priority for you, keep on readin’! At only 11 lbs, the UPPAbaby G-lite is one of our favorite umbrella strollers for grandparents who are looking for something lightweight and very high quality. The sleek G-Lite is easy to fold and—unlike the Summer Infant 3D Lite—has a HUGE sunshade (this counts for a lot when you’re out on a sunny day). The 2018 model has two recline positions for nappers, plus a basket that’s easy to access and carries up to 10 lbs. It also has a mesh sling seat that keeps kids cool on hot days and can be removed for cleaning. 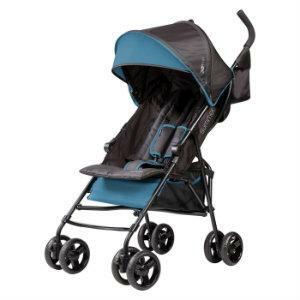 The G-Lite’s quality wheels and four-wheel suspension give it a surprisingly smooth ride for an umbrella stroller. Other grandparent-friendly features include a kick-proof rear frame, a cupholder, and a standing fold. It can hold kids from 6 months up to 55 lbs. No, it’s not a jogging stroller (despite the confusing name) but the City Mini is a wonderful stroller for grandparents who need a reliable stroller for years to come. The City Mini is a parent-favorite stroller that’s topped our lists for nearly 10 years. It’s a compact, lightweight stroller that folds with one quick motion and fits into the trunk of most cars. It rides very well and steers with one hand, though if you need an all-terrain stroller for riding over bricks, gravel and the like, we highly recommend the all-terrain version of this stroller, the City Mini GT. The GT is a couple of pounds heavier, but still has the nice compact fold. The City Mini has a near-full recline, a nice storage basket, a HUGE canopy, and is very easy to collapse and carry. Yes, if you’re looking for a higher quality general purpose stroller that’s a little more robust than an umbrella stroller, this is the one we recommend. Note: the current model is still the 2016 (as of May 2018). Once your grandchild begins the process of potty training (usually around 2-3 years of age, give or take), you might want some items to make it easier for them to use the potties at your house. The most important are a potty seat and a step-stool, though a few other items will certainly make life easier if you have the kids at your house more frequently. 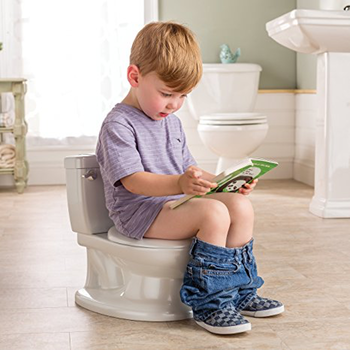 Because little tushies can fall right through a regular toilet seat… potty seats sit right on top of your regular toilet seat. They take up less room than a potty chair in your house, though some younger children may find them a bit intimidating if they’re just starting out with potty training. Avoid the really cheap Disney (and such) potty seats you can buy at the drugstore. They tend to slide around too much and can cause falls. This toilet trainer has a knob you can adjust to get a tight fit on your regular toilet seat so it doesn’t slide around. It also has a splash guard and a handy hanging hook so you can hang it up when it’s not being used. It’s the little things that make a big difference! You definitely need a step stool at your house. Your grandchildren need them to reach the faucet to wash their hands, brush their teeth… and do just about anything at the sink. Kids use them until about age 7 or so. Trust me, you don’t want to lift them up to the sink every time they need to wash their hands – gah. This step stool is 5 1/8″ tall and has an anti-slip bottom and top for extra sturdiness. I love this one because it’s inexpensive (woohoo! ), not super “kid” looking, and small enough to store away when your grandbabies go home. There’s also the BOLMEN (~ $8, also from Ikea), which is a bit taller and can hold a max weight of 330 lbs (!!) — meaning it’s suitable for kids and adults. This faucet extender helps kids wash their hands without needing Grandma or Grandpa to lift them up to reach the water. It’s totally worth buying – your back will thank you! That’s it, grandparents! Thanks for sticking with us! Now go enjoy those delicious grandbabies of yours!